Jeffrey Meade’s guess is correct: this type inventory includes a great variety of large sized type. 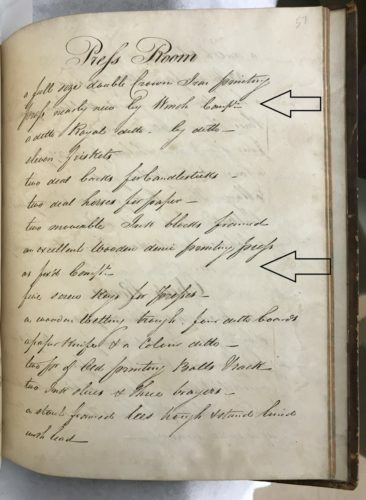 It belongs to a longer document made in June 1819 recording the furniture of the Theatre Royal at Drury Lane when the theater was put for sale by its Company of Proprietors (Folger MS W.b.383). Drury Lane was acquired later that year by the actor and manager Robert William Elliston. In addition to type, the inventory recorded a “Press room” (located below the theater stage) with two iron presses and a wooden one. These three presses were also described by their size: a Double Crown press platen measures 34 inches by 22 ¾ inches (L x W), a Double Royal one 40 by 25 inches, and a Demy 24 by 18 inches. Large playbills were pasted on walls and posts to announce an evening production. Their text needed to catch the attention of passersby. 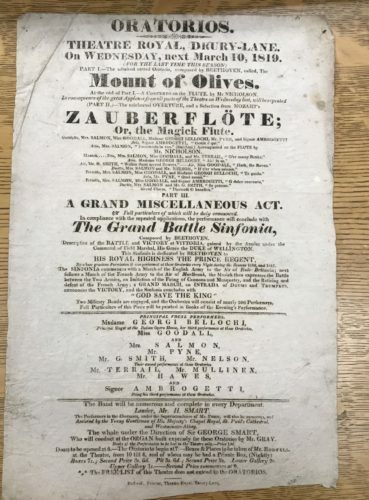 The playbill below shows the dazzling array of type sizes typically used in these prints for advertisement from this era. Out of 34 lines of text (including rules), I counted sixteen different sizes of type ranging from 8 to 186 point. 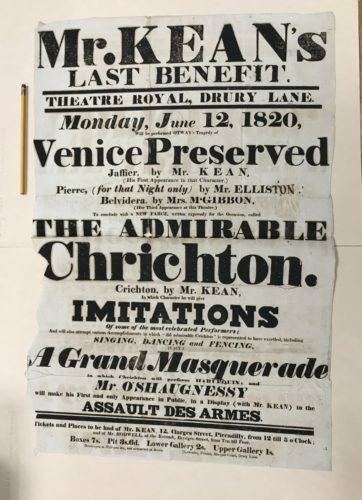 The letters of various sizes guided the eye of the reader through a large amount of information and highlighted the most exciting parts of the advertised evening, in this case, with the celebrated actor Edmund Kean. His name, after being featured prominently in a 186-point size at the top of the bill, appeared three times lower in the text in increasingly smaller type. 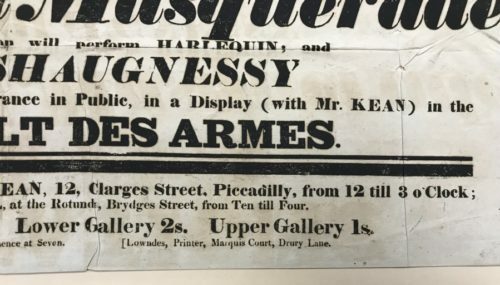 His last appearance on stage was indicated with his name in a 20-point type size while the genre of the performance in which he were to appear (a “Masquerade” and “Assault des Armes”) were set respectively in 66 and 50 point and the name of his partner on stage, the actor O’Shaugnessy, in 46 point. 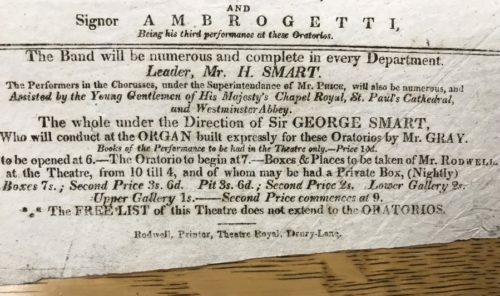 Small playbills were generally sold to the audience in the theater. While they used a smaller range of type sizes, they highlighted words or text through a frequent combination of capitals, italics and roman, and lower type also in italics and roman. 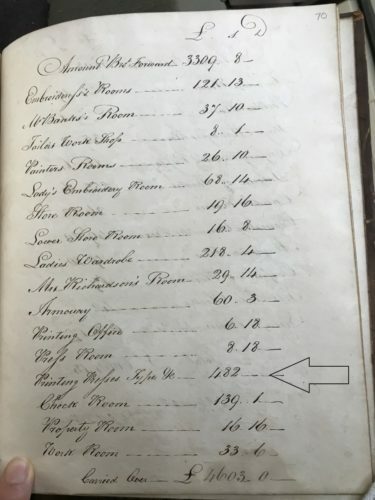 But the Drury Lane inventory is also interesting as it shows that the theater then operated its own print shop. Such development was recent and had started in 1817 (which would explain the mention that both iron presses were “nearly new”). 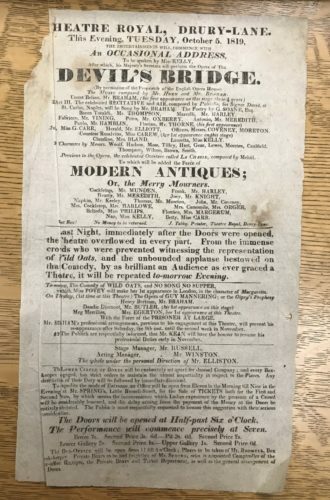 Drury Lane was not the only theater to have brought printing in-house during this period (the Adelphi Theatre owned a press in 1829). Printing playbills had always been a lucrative job.2 When becoming their own printers, theaters may have wished to cut their middle costs at a time when they were expanding the type of advertisement they were producing. 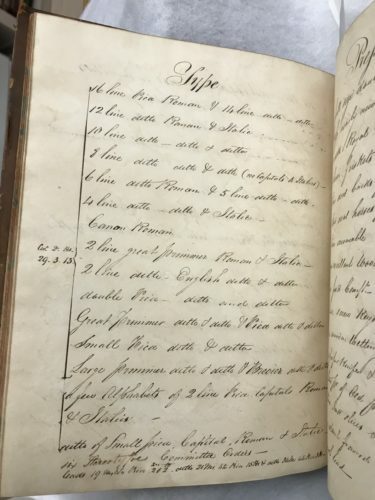 But this required them to invest a significant amount of money in printing equipment (presses and type), as the Drury Lane inventory clearly indicates. 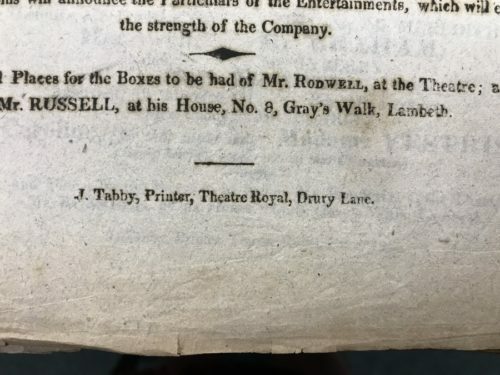 Despite employing four printers, the theater kept commissioning work to local printers, including Charles Lowndes and Joseph Mallet, whose names appear on playbills. Lowndes had worked for the theater industry since 1792 and was until 1817 the main (or sole) printer working for Drury Lane. Joseph Mallet, whose shop was in Soho, also printed for the theater during this period. The theater, then, seemed to have been unable to fulfill all its printing needs and kept sharing the work load with local printers. More than the printing itself, the setting of the text in type—with its combination of sizes, of upper and lower cases, italics and regular type—must have been extremely time-consuming. Proofreading and correcting typos would also have been laborious, especially when working under tight deadlines. 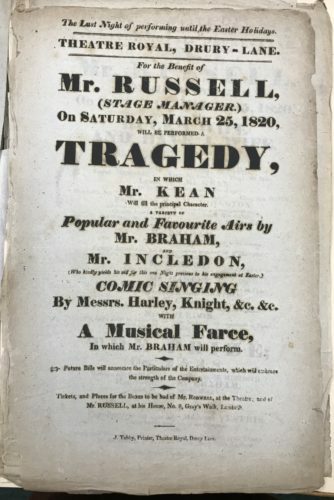 Furthermore Drury Lane also printed promptbooks, sold to the audience like the small playbills. These would also have been printed under tight deadline for a specific performance. 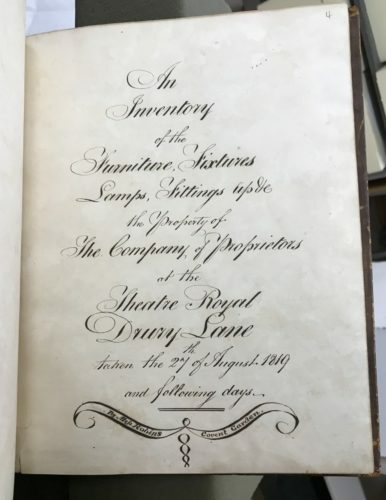 A prompt book printed at Drury Lane by John Tabby. 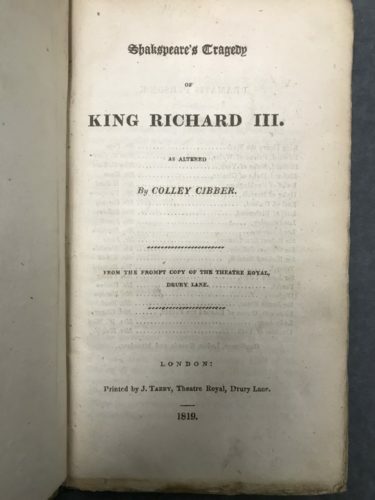 Folger PR2821 1819a copy 2 Sh.Col. Tiffany Stern’s statement that the early modern playhouses “needed the printers more than the printers (who were also publishers) needed the playhouses” thus seems to have remained valid for the nineteenth century.5. If money could be made out of printing theater ephemera, it was a demanding business. The decision of Drury Lane to run its own press does not appear to have been entirely successful and Tabby seems to have been the last manager of the press at the theater. But clearly much more work and investigation remains to be done on this interesting slice of theater and printing history. Although there is no evidence of this, it is tempting to think that he was related to John Rodwell, one of the booksellers who published a new edition of Shakespeare’s plays in 1827.